Stuffy nose (a.k.a. nasal congestion) is arguably one of the most horrible things about getting the common cold or a case of sinusitis. It's not much better if it's caused by allergies either! This post was prompted because one of my friends called to ask how to get rid of her stuffy nose. She feels like she is coming down with that awful thing....the Big Bad Cold. HELP! I Can't Breathe! The Sinus Congestion is Killing Me! One of the very worst things about getting a cold (or allergy season) is nasal congestion---more commonly called a stuffy nose. There are some pretty simple and powerful ways to clear up that horrible stuffy nose naturally, without putting nasty chemicals into your body. Here are my favorite natural ways to get rid of nasal congestion from easy to more difficult. You may also be interested in these related articles in my cold and flu care series: How to Deal With Symptoms of Cold & Flu if You Do Happen to Get Sick (Fever, Congestion, Cough, Sore Throat, etc. ), Here is an article for children specifically: How to Boost Your Child's Immune System. What is a Stuffy Nose, Anyway? A stuffy nose, or nasal congestion, is caused by inflammation of the tissues in the sinus cavities. Allergies, a crummy case of sinusitis, or cold/flu (caused by one of over 200 virus strains) can all cause the yucky phenomenon we know as a "stuffy nose." When the membranes in your sinus cavities and lining of the nose become inflamed and irritated, excess mucus and swelling creates nasal congestion. 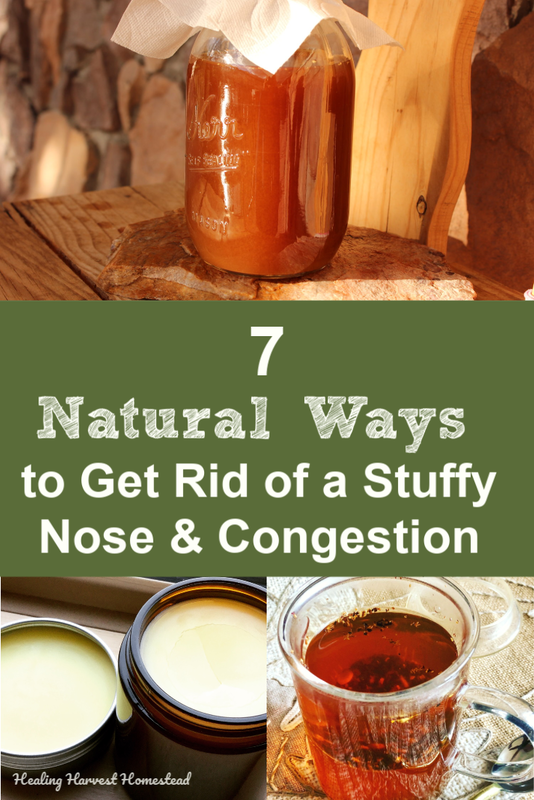 Luckily, there are some natural ways to stop that stuffy nose and nasal congestion! These ideas for clearing up a stuffy nose are listed in order from the simplest to more complicated remedies. They are not listed by effectiveness, so feel free to try any and all of them. Steam is one of the first remedies I turn to for clearing up a stuffy nose. That's because it's simple. Just get in the shower! Or bring a shallow pan of water to a simmer, place your face over it, and cover your head with a towel. If you want an extra kick, just drop a few drops of Eucalyptus, Peppermint, or Camphor Essential Oils (or a nice blend) into your shower or the pan of water. Hooo--eeeh! You'll be feeling better fast! The reason steam works so well is because it helps almost immediately reduce inflamed nasal tissues. Also, the steam helps to thin the thick gooey mucus in the upper passages of your nose. Just mix 1 tsp of sea salt (NOT table salt because it contains iodine) with 1 cup of warm purified or distilled water. Mix well until the salt is dissolved. Place in a bottle with a dropper once the salt is dissolved. To use this solution, just blow your nose as well as you can. Lay your head back---or even just lay down---and place a few drops in your nose. Let stay there for a few minutes. Give the solution time to break down that mucus. About 5 to 10 minutes is good. Now sit up and blow your nose again! Get the Newsletter & Never Miss a Self-Reliant Thing! Fire Cider is one of those very old traditional folk remedies, and everyone who knows about it seems to have their own way to make it. 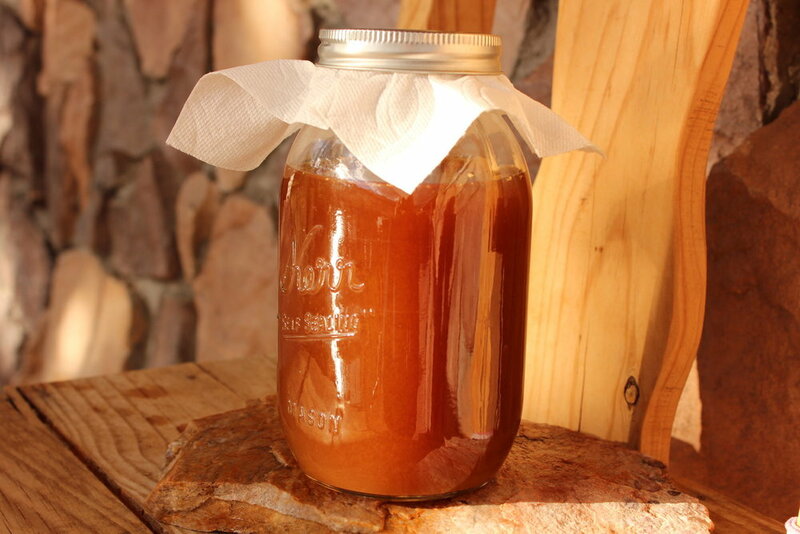 Fire Cider needs to infuse for at least 6 weeks, and up to several months, so you want to start making it early....long before Winter comes along. You can take Fire Cider as a tonic to help prevent colds and flus, but if you are unfortunate enough to have to deal with a stuffy nose at any time, fire cider is known to help break up congestion, thin out the mucus, and help clear your sinuses. The herbs in fire cider build your immune system too! Personally, I love Fire Cider! This is one easy remedy I highly recommend. Here is my version of fire cider, and it's never too late to start making it! Here is some Fire Cider—-I know it sounds a little scary, but this stuff really works! This is another one of my most favorite remedies for helping alleviate stuffy and runny noses. This is a sweet/sour/spicy concoction of raw apple cider vinegar, lemon juice, honey, ginger root, cinnamon chips, and cayenne pepper powder. It's quick to make, and once you start taking it, you may just become addicted! It works like a charm, too! The way it works is the healing powers of honey and raw vinegar combine with the nasal clearing ability of the cayenne for a remarkably effective and safe decongestant! Here is my recipe for a natural decongestant you can make yourself! A tea infusion is a little different than making a cup of regular tea. Basically, you let the herbs steep in the water for one to several hours in order to get the most out of the medicinal herbs. You can find out more about herbal water infusions in this article of my How to Start Using Herbs Series. This is not a great tasting tea, I have to tell you; but if you are looking for results and calming the inflammation from that cruddy, stuffy nose, then you should give this a try! The herbs in this tea help strengthen the respiratory system, calm inflammation of the sinuses, and break up mucus. It's a safe herbal blend too---even children can drink it up! You might want to sweeten it first, though. Here is where you can find the herbal recipe for Stuffy Nose Tea, and here is an article with more information about how to make herbal tea infusions too. This is Tea for the Sniffles---A great blend to help reduce sinus inflammation and relieve stuffy nose. Frankly, I love tinctures. Once they are made, they are so easy to use. They are also easy to take along with you! This is an herbal blend that my family has been using for years, and it really works---quite fast, too! Tinctures are actually very easy to make....they just take time to infuse: about 4 to 8 weeks depending on the herbs you use. There are two main herbs in this tincture: Mullein and Marshmallow. This combination has the perfect blend of anti-inflammatory properties with expectorant and decongestant properties. When I share this with my friends during allergy season, they are seriously amazed at how fast they feel better! Both of these herbs are extremely safe, even for children. Mullein also helps strengthen and tone the lungs. I purchase my herbs at Starwest Botanicals, unless I forage or grow them myself. Starwest has excellent quality herbs, teas, and essential oils, ship quickly, and they value sustainability. To find out how to make this Breathe Tincture, just click the link. To find out more about tinctures and easy directions for how to make a tincture, visit this article. AND...if you don't want to dabble with making your own tinctures or teas yourself, Starwest Botanicals also has ready-made herbal teas and tinctures for you! Some essential oils are amazingly fabulous for helping clear up your sinuses! Eucalyptus, Peppermint, Tea Tree, Rosemary, etc. are some examples. Always dilute your essential oils in a carrier oil before using on your skin, just to be on the safe side. You can add essential oils to a carrier oil and rub in that way. A carrier oil would be almond oil or fractionated coconut oil. A good amount of essential oil for an adult is 12 to 15 drops or so in a 10 mL roller bottle. Add in your essential oils, swirl gently. Then add your carrier oil and shake to mix. My preferred way is to use the essential oils in your very own Vapor Rub. You can adjust up or down, depending on how strong you want your vapor rub. I personally am a bit heavy handed with the oils I use to clear sinuses. If, once you get the essential oils added to the melted oils, the mixture doesn't smell strong enough for you, just add a bit more. Essential oils are very powerful, so a little does go a long way. Essential Oils---see my blend below OR you can purchase great blends that are meant for clearing your sinuses and helping with respiration. That link is to Rocky Mountain oils--just search "Breathe Ease" and it will pop up. NOTE: If you are using this blend to make the Vapor Rub Salve recipe above, just increase the drops of the essential oils proportionately until you have a total of roughly 200 drops. ANOTHER NOTE: Eucalyptus and Rosemary may not be safe for children under 10. I have used them with my children with no issues, however, be sure to do your own research and make sure you’re comfortable. If in doubt, ask your doctor. Step 1) Place the almond oil in a Mason jar, along with the beeswax. Step 2) Grab a sauce pan and put about 2 inches of water in it. Place the Mason jar with oils into the water. Step 3) Set burner to low, and bring the water to a very low simmer. The beeswax will melt into the almond oil. Step 4) Remove the Mason jar from the pan and give a good stir. Then stir in your essential oils well. Step 5) Pour into a clean jar. I use amber glass jars to hold my salves. Step 6) Allow to set up for a couple of hours, depending on how warm it is. Don't touch it for awhile---just let it firm up. It's now ready to use! Rub it onto your chest and breathe deeply! Nothing beats a good homemade salve. Finally, stay hydrated by drinking lots of tea or water! Water helps to break up yucky congestion too! The more water you drink, the more functional your body systems will be, including your sinuses. And one more thing: If you are ill, get some rest! Your body will thank you! You know what? It's easy to head to the store and grab some over the counter chemical concoction that will temporarily clear up your congestion. However, these products do terrible things to the delicate blood vessels in your nasal passages and are horribly addictive too! Turning to nature and Grandma's natural remedies is the best way to get rid of nasal congestion. Really. Anyway, that’s my own personal opinion. And these things are SO easy to do, too. I hope you'll give one or more of these remedies a try next time you are battling a case of stuffy nose or nasal congestion! How do you deal with a stuffy, congested nose? I'd love to hear about your own remedies, or if you've tried any of mine! P.S. Don't forget to sign up for the Newsletter and never miss a thing! You’ll get immediate access to the Resource Library, which is a growing collection of downloadable and printable resources to help you with your self-reliance journey (like the one in the form below). P.P.S. Have you thought about learning about herbalism? How to make your own plant medicine? Have you dreamed of becoming independent from Big Pharma and commercial drugs? I've been taking courses a long time, and I love the classes from The Herbal Academy of New England. Take a look! They seriously have something for everyone!